Convenience foods are a mama's best friend, and the king of all convenience food is, of course, frozen pizza! Unfortunately, most frozen pizzas don't fit into the MSPI diet. (Although, Amy's Kitchen makes a pretty decent Roasted Vegetable Pizza that's MSPI-friendly, but it's pretty expensive.) So that means making your own frozen pizza, and this recipe works great! You can easily adapt each individual pizza to your family members' preferences. Some with veggies, some without. Some with MSPI-friendly cheese -- or real cheese for those who can have it -- some without. Have fun! Let your kiddos make their own! I highly recommend making a double batch ... one batch to eat right away and another to freeze. Trust me, you'll love having these on hand! Chopped pizza toppings, such as pepperoni, onions, green peppers, olives, etc. Crumble and brown the ground beef or Italian sausage. If using beef, season it with salt, pepper, garlic powder, onion powder, oregano, etc., to taste. Set the meat aside to cool. Turn onto lightly floured surface. Knead lightly 10 times. Roll or pat dough to ½-inch thick. Cut with floured 2½-inch round cutter, rerolling the scraps until all the dough is used. (You should end up with 12-14 biscuits.) Using an ungreased muffin pan, place one biscuit in the bottom of each cup. With floured fingers, push and flatten the biscuits up the sides of the cups. Divide ground meat between the cups, about 2 tablespoons each. Add 2 to 3 tablespoons of sauce on top. Sprinkle with pizza toppings and cheese. Bake for 15 minutes or until biscuit shells begin to brown and toppings are heated through. Remove from oven and allow pizzas to rest a few minutes, then remove pizzas to a serving dish and enjoy! 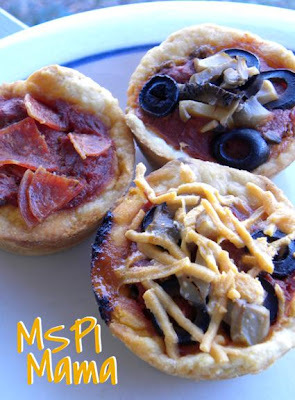 To freeze: Arrange pizza cups on a cookie sheet and place in the freezer overnight. Once frozen, pizzas can be stored in a freezer-safe container or wrap, such as foil. To reheat frozen pizzas, heat in the microwave one to two minutes, or until hot. Tip: Short on time? 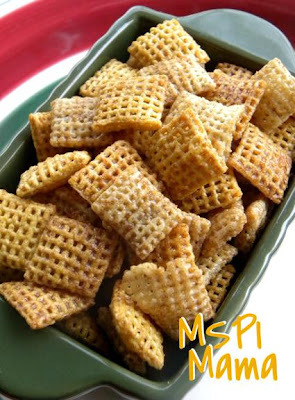 Use MSPI-friendly biscuit mix, such as Bisquick, and follow the package directions to prepare the dough with rice milk. Or if you can find ones that are safe for you, use MSPI-friendly canned biscuits. 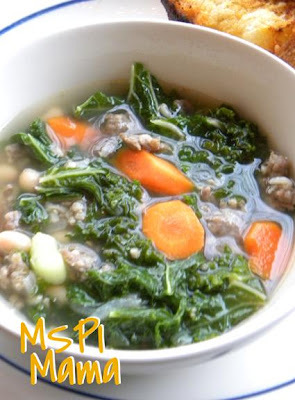 Vegetarian: Replace the ground meat with sauteed vegetables, such as spinach, mushrooms, onions, etc. Or try this MSPI-friendly meat substitute. Whoever came up with the idea to make flavored marshmallows should get a medal. They're so fun! 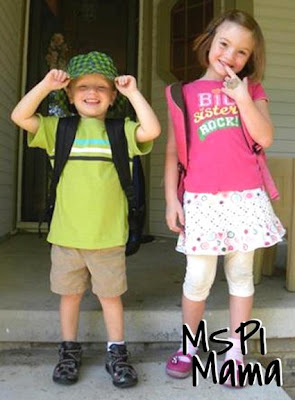 And MSPI-friendly! 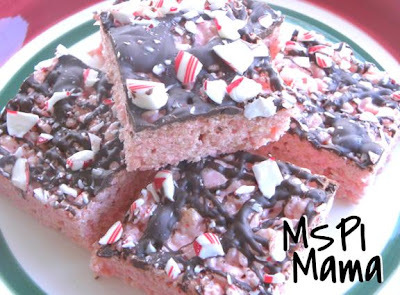 This recipe, which comes from Our Best Bites, takes the humble Rice Krispie treat to a whole new level by utilizing peppermint marshmallows and drizzling it with chocolate. Genius! And delicious! Perfect for a platter of Christmas treats. Grease a 9x13 pan and set it aside. Melt margarine in a very large bowl in the microwave. Add marshmallows and stir to coat. Heat in 30-second intervals, stirring in between, until melted and smooth. (You can do that whole process on the stove top as well.) Add cereal and stir to evenly combine. With greased hands, press mixture into prepared pan. Place chocolate chips, oil and peppermint extract in a small bowl. Heat in the microwave in 30-second intervals, stirring in between, until melted and smooth. 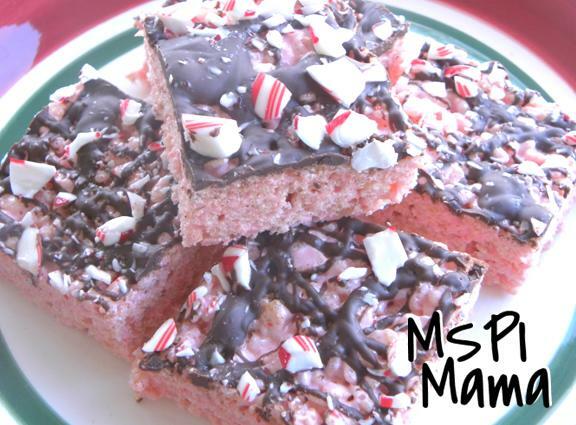 Drizzle chocolate on top of the Rice Krispie treats and sprinkle candy canes on top. Let sit until chocolate is set, place pan in fridge to speed process along. Cut into squares and eat up. Tip: If you can’t find the peppermint marshmallows, use regular marshmallows and add ¼-½ teaspoon peppermint extract (or to taste) and a few drops red food coloring to the melted marshmallow mixture. I have a confession to make. I am in LOVE with Costco. As I mentioned on my Facebook page a few weeks ago, I finally broke down and got a membership, and I haven't looked back since. Ummm, $16.59 for 12 quarts of Rice Dream rice milk? Yes, please! And their organic vegetables and fruits? Fabulous, just fabulous! But, my favorite thing of all has to be their rotisserie chicken. Yes, it's MSPI-friendly! And it's just delicious. Tender and juicy. Yum! (Yes, I know rotisserie chickens aren't anything new or special. But Costco's is so good!) I can get two to three meals for our family out of one chicken. I use it in soups, salads and other yummy dishes. And it's less than $5! Such a great deal! But I take the savings a step further. 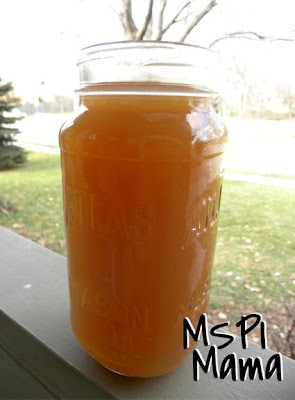 I use the bones and scraps from the chicken and use it as the base for homemade chicken stock. And it's "Nearly Free" to make this, since you're using items you would normally throw away. This really doesn't even seem like a recipe that I'm sharing with you, more like a method. Adjust to what works best for you. If you're having turkey for Christmas dinner, you can use this method to make turkey stock. Whenever cooking a meal, place the leftover bones, skin and scraps from the chicken and the scraps from vegetables, such as onion and garlic skins, carrot peelings and celery tops, in a large Ziploc-style bag in your freezer. Continue to add to the bag as you prepare meals. Once the bag is filled, empty the contents into a slow cooker. Sprinkle generously with salt and pepper. Toss in the bay leaf. Pour in water until all the contents are fully submerged. Place the lid on the slow cooker and turn the cooker on Low. Cook 8-10 hours. Remove the large scraps from the broth and throw them away. Pour what remains through a fine sieve or colander into a large bowl. Taste the stock. Add more salt, as needed. Place the bowl in the refrigerator and cool for several hours. Skim off any congealed fat. Use broth immediately or divide it into freezer-safe containers and store in the freezer. Tip: If the idea of using scraps creeps you out, then follow this recipe, which starts with a whole chicken and vegetables. Vegetarian: To make vegetable broth, use only vegetable scraps. 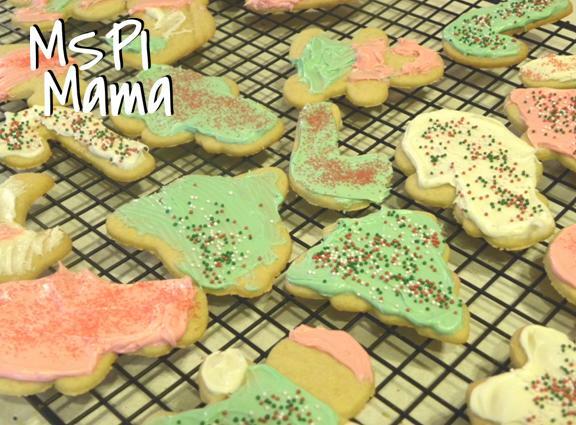 What would Christmas be without cookies? And these cookies, my friends, are right at the top of cookie perfection. Crunchy on the outside, chewy on the inside. 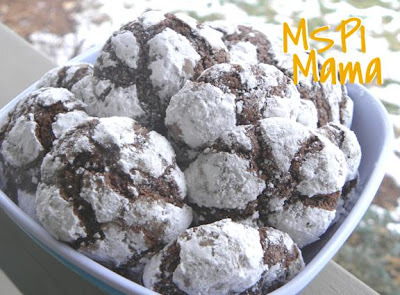 Bursting with chocolate flavor that's only heightened by a roll in powdered sugar. Seriously good stuff. Oh! And this is one of my Quick Start recipes. Yes! No soy oil or lecithin in these little gems. Now, I am going to warn you. These cookies aren't difficult but they are labor intensive. And you have to be patient. The dough needs to chill before you form the cookies. But it's worth all the work! Speaking of chill. The recipe for these cookies originally says to refrigerate the dough. Don't do this! Put the dough in the freezer! Trust me on this one. The dough will be much easier to work with if it's super cold! And don't worry about the dough freezing solid. This won't happen. Combine granulated sugar and oil in large bowl; add cocoa, beating until well blended. Beat in eggs and vanilla. Stir together flour, baking powder and salt; gradually add to cocoa mixture, beating well. Cover; freeze until dough is firm enough to handle, at least 6 hours or overnight. Heat oven to 350 degrees. Lightly grease cookie sheet or line with parchment paper. Working with one batch at a time, shape dough into 1-inch balls; roll in powdered sugar to coat. Place about 2 inches apart on prepared cookie sheet. Put remaining dough back in freezer while first batch bakes. Bake 13 minutes or until almost no indentation remains when touched lightly and tops are crackled. Cool slightly. Remove from cookie sheet to wire rack. Prepare next batch of cookies. Makes 4 to 5 dozen cookies. Tip: If you need to avoid eggs, Food Allergy Mama substitutes 1 cup of applesauce for the eggs in her version of the cookies. Thanks to my dad, who goes salmon fishing every year, and my mom, who likes to can, I have several jars of canned salmon on hand at all times. This salmon is a lifesaver on busy days, especially during the crazy holiday season. And my kids LOVE salmon. No one ever complains about dinner when I serve salmon. At a moment's notice, I can throw together recipes like Salmon Cakes and Tuscan Salmon Pasta. They both contain ingredients that I regularly stock in my pantry and kitchen. Or I can make this chowder. 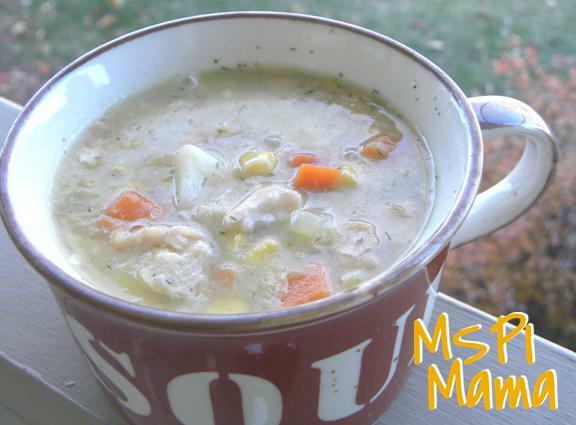 This soup is warm and satisfying on a cold evening, and like the other recipes I mentioned, it's easy to keep these ingredients on hand for a last-minute meal. Heat olive oil in a large pot over low heat. Saute onion, celery and garlic until tender. Stir in the flour. Continue to stir for a few minutes. Stir in broth and rice milk and bring mixture to a slight boil. Stir in potatoes, carrots and seasonings. Bring to a boil and reduce heat. Simmer 20 minutes or until vegetables are tender. Stir in salmon and creamed corn. Cook until heated through and adjust seasoning to taste prior to serving. Tip: The smaller you dice the potatoes and carrots, the quicker they will cook. Some of you occasionally like to share recipes with me, and I think that's great. I love to hear what's been a success for you! Since I'm not very quick about getting around to trying out those recipes and posting them here on the blog, the best way for all of you to share your recipes with each other is over on my Facebook page. When I originally began my page, I included a thread on the Discussions tab for Readers' Recipes, but Facebook has recently removed Discussions. Boo! But don't let that stop you from sharing your recipes. 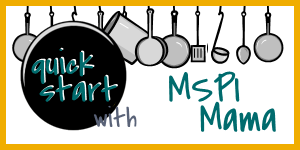 You can just post the recipe on the Facebook wall or share a link, if the recipe is from another website and include any MSPI changes. Fortunately, before Facebook closed Discussions, I was able to save a copy of this recipe. It was posted by MSPI Mama reader Lindsey. Thanks, Lindsey! 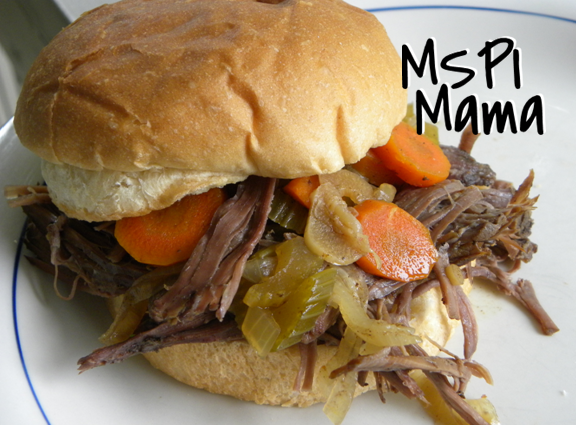 The recipe is yummy and super easy to make in the slow cooker. Pour the olive oil into a slow cooker and swirl to cover the bottom. Season the chicken breasts with salt and pepper, then place them in the slow cooker. Layer sliced onion on top of chicken. Sprinkle herbs and garlic cloves over the top. Pour in vinegar and top with tomatoes. Cook on high three to four hours. Serve chicken breasts whole, chopped or shredded with vegetables and sauce over angel hair pasta or rice. Tip: The size of your chicken breasts, how many you are using and whether they are fresh or frozen will greatly determine how fast they cook. Cook it too long, and the chicken will dry out on you. I made this with four frozen chicken breasts, and four hours was more than enough time to completely cook the chicken. Cranberry sauce is a must-have on every Thanksgiving table, yet it often gets overlooked when it comes time to fill our plates. Sure, we all take a little spoon of it, but people rarely go crazy on it. (Gotta save room for the turkey, dressing and mashed potatoes!) So that means you're left with lots of cranberry sauce when the table is cleared. What to do with that leftover cranberry sauce? Add it to apple crisp! And if you don't have cranberry sauce leftovers, just crack open a can. Works great! In a medium-sized bowl, stir together the cranberry sauce and the lemon juice. Add the apples, stirring to combine. Taste the mixture. Add sugar, a tablespoon at a time, until you reach the sweetness you prefer. Pour mixture into a 2-quart casserole dish that has been rubbed with canola oil or coated with cooking spray. In a small bowl, combine the oats, flour, walnuts, brown sugar and salt. Drizzle in the canola oil. Stir until thoroughly mixed. 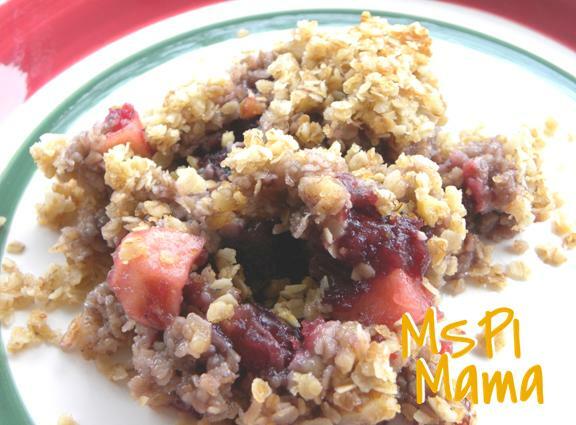 Spread the oats mixture over the top of the cranberry-apple mixture in the casserole dish. Bake the casserole dish, uncovered, in the oven for one hour. Set aside to cool before serving. Tip: Make sure you taste the mixture! The amount of sugar you use will greatly depend on the sweetness of the cranberry sauce and tartness of the apples. I only added 1 tablespoon of sugar when I made this. I seem to have gone a little pumpkin crazy lately ... Pumpkin Muffins ... Turkey Pumpkin Chili ... 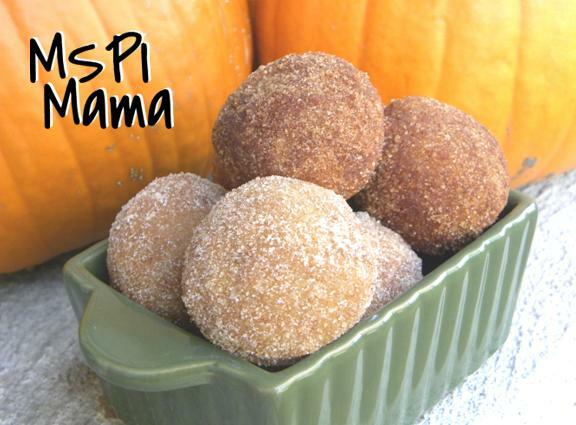 Baked Pumpkin Spice "Donut Holes" ... but it's all so good! I can't seem to help myself. I hope you all don't mind me posting another one. This bar recipe has just enough sweetness to satisfy your sugar cravings but it won't send you into a sugar coma either. It would be a great addition to your Thanksgiving dessert spread! With an electric mixer, cream shortening and sugar on medium-high speed until smooth; beat in egg and vanilla until combined. Beat in pumpkin puree (mixture may appear curdled). Reduce speed to low, and mix in dry ingredients until just combined. Fold in chocolate chips. Note: If you don't have pumpkin-pie spice, substitute 1½ teaspoons cinnamon, ¾ teaspoon ginger, ½ teaspoon nutmeg, ¼ teaspoon allspice and ¼ teaspoon cloves. Tip: If you are avoiding soy oil, instead of using regular shortening, try Spectrum Palm Shortening, coconut oil or even canola oil. I can't guarantee the results, because I haven't tried this recipe with those products, but I don't see why it wouldn't work! I recently picked up a bunch of kale at the store. I wasn't exactly sure what I was going to do with it, but I was confident I could figure something out. After coming home and perusing the web for a few minutes, this is what I ended up making. 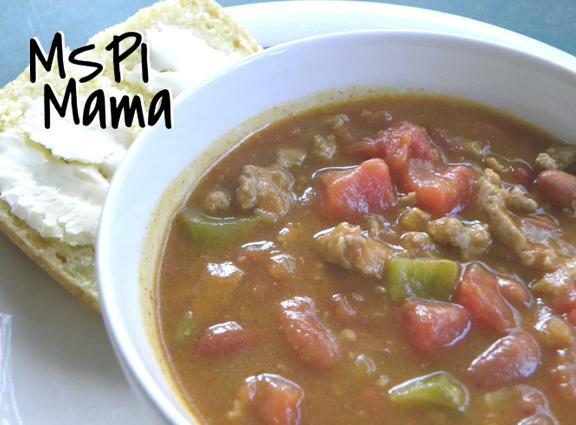 This soup warms you through and through and is quite tasty. If you can't find kale at your store, toss in some fresh spinach instead. The original recipe doesn't call for any grain or pasta, but I had some leftover brown rice on hand, so I tossed it into the soup. Heat the olive oil in a large pot over medium heat. Add the sausage. Break up the sausage into pieces and cook until no pink remains. When the sausage is fully cooked, add the onion, carrot, celery and garlic. Stir and cook until the onions are soft. While the vegetables are softening, pull the kale leaves from the stems and tear into small pieces. Place the torn kale leaves in a colander and rinse well. Once the onions in the pot have softened (the other veggies may not be soft, that's okay), add the kale. Stir and cook for about 5 minutes or until the kale is wilted. Drain the can of beans and add them to the pot. Also add the chicken broth, water and spices. Stir to combine and heat through (about 10-15 minutes). If using the rice, add it now. Adjust the salt and other seasonings, to taste. Host the big meal. If you're the one in charge of the menu, you will know for a fact what you can and can't eat. Offer to supply several dishes. If dressing is your favorite Thanksgiving dish, then make it yourself! That way you won't feel deprived. And of course, bring a dessert you can eat! If all else fails, fix a small Thanksgiving meal at home prior to the big day with all your favorites. Roast a turkey breast or even a chicken. Save some leftovers and fix yourself a plate to take to the real deal. Heat it up when everyone is sitting down to eat, and you won't miss out on anything. Those are some of my tips. Now it's your turn! Leave a comment here or on Facebook letting everyone know what you're doing to make Thanksgiving a wonderful experience for everyone at the table! In order to get you ready for the big day, I'm sharing with you a recipe I created that would be a great addition to any Thanksgiving spread. If you've ever had corn pudding made with one of those boxes of Jiffy corn bread mix, this was inspired by that! Heat oven to 350 degrees. 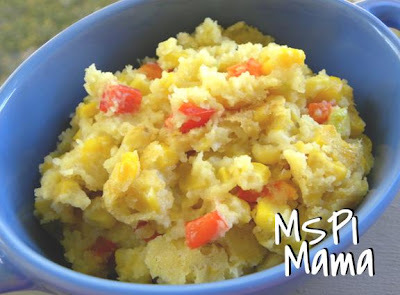 In a medium bowl, mix together the corn, cream-style corn, pepper, onion, egg and rice milk. In a second bowl, whisk together the remaining ingredients. Add the dry ingredients to the wet and stir until well combined. Pour mixture into a 9x13 baking pan that’s been coated with cooking spray. Bake in oven for 45 minutes. Baked Pumpkin Spice "Donut Holes"
Who doesn't love donuts? 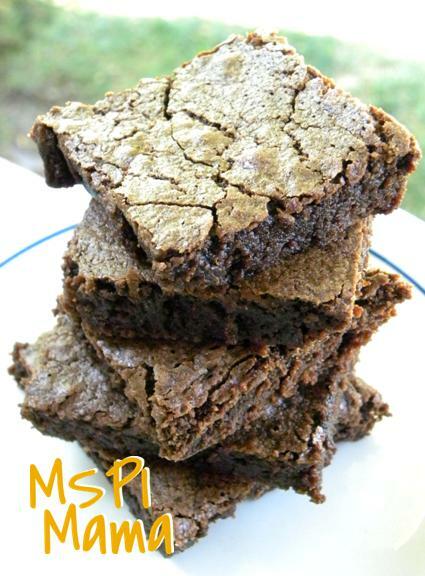 They just melt in your mouth, but of course, they rarely fit into the MSPI diet. So that means making them myself, but I'm not a big fan of deep-frying. (I got burned once from attempting to make apple fritters in college. I didn't like that and don't want to repeat it!) However, I've been seeing lots of recipes for baked donuts, but those recipes require a special donut pan, which I don't have. I want one! But I don't currently have one. Oh, Santa -- a.k.a. my hubby (we'll see if he reads this post!) -- wouldn't this be lovely under the tree? Wink. Wink. In case my Christmas wish doesn't come true, I'll just have to settle for these "donut holes," which are made in a mini muffin pan and then rolled in cinnamon and sugar. The kids loved them. I loved them. We were all quite happy! Preheat oven 350 degrees. Coat each cup in a 24-cup mini muffin tin with baking spray or grease generously. In a medium bowl, whisk together flour, baking powder, salt and spices (through cloves). In a separate, large bowl whisk together oil, brown sugar, egg, vanilla, pumpkin and rice milk until smooth. Add dry ingredients to wet ingredients and mix until just combined. Spoon 1 tablespoon of batter into each muffin cup. Bake at 350 degrees for 10 minutes or until a toothpick comes out clean. While the donuts bake, melt margarine in one bowl and combine granulated sugar and cinnamon in another bowl or a large Ziploc-style bag. Remove donuts from oven and cool for 2 minutes, or until just cool enough to handle. Dip the cooled donuts in melted margarine, then roll in cinnamon sugar or shake in bag to coat. Repeat steps with remaining batter. Add extra cinnamon sugar as needed. Recipe makes approximately 4 dozen donut holes. Tip: I ran out of cinnamon, so the donut holes in the top of the photo are coated in cinnamon sugar, while the ones on the bottom are coated in sugar. Both are equally delicious! I know what you're thinking (cause I thought it, too!) when you saw the name of this recipe: Pumpkin? In chili? Guh-Ross! But my friends, it's good. Really good! First off, you don't taste the pumpkin! The spices completely neutralize the flavor. Secondly, the pumpkin adds a wonderful silkiness to the chili. Similar to how it would feel if you melted a block of Velveeta into it. 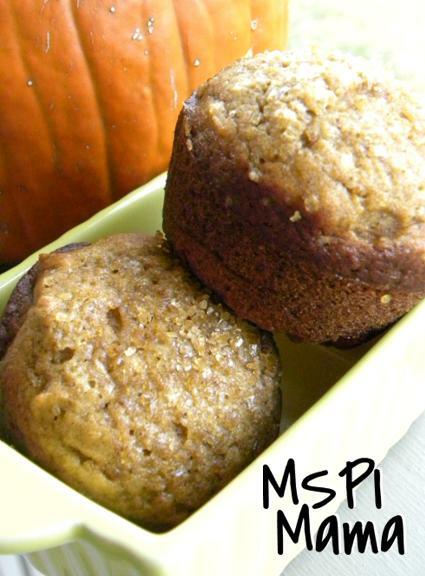 Thirdly, pumpkin is sooooo good for you. Extra nutrition for you family, and they won't even know it! I served this with corn bread. Yum! To make this vegetarian, just leave out the meat and add another can of beans and more veggies. Heat oil in a large pot over medium high heat. Add onion, bell pepper, jalapenos, if using, and garlic and cook, stirring frequently, until tender, about 5 minutes. Add turkey and cook until browned. Add tomatoes, pumpkin, water, chili powder, cumin, salt and pepper and bring to a boil. Reduce heat to medium low and add beans. Cover and simmer, stirring occasionally, for 30 minutes more. Ladle chili into bowls and serve. Tip: Whatever you do, make sure you use plain pumpkin, NOT pumpkin pie filling. Yuck! I am always on the lookout for simple and delicious recipes that are made with ground meat. Why? 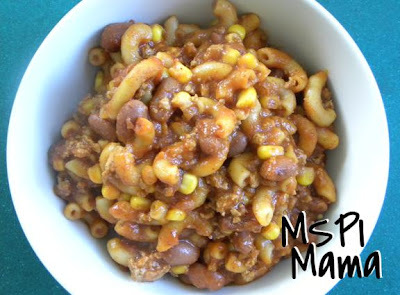 Because it's inexpensive and thaws quickly when I pull a pound from the freezer and need to get dinner on the table quickly. I have my usual repertoire of tacos, spaghetti and hamburgers, but that gets old really quick. So it's nice to try something new. This recipe from Whole. New. Mom. is unbelievable! The first time I made it, I nearly swooned! If you've never had curry, please, please, PLEASE try it! So stinkin' good! And it's easy and made with ground beef. Seriously simple stuff here. The recipe is also easily adapted to the foods you like or have on hand. You can use any type of ground meat -- turkey, chicken, pork, venison. (It would be really good with wild game because the spices would help disguise the gaminess of the meat.) Or leave out the meat all together for a vegetarian version. Clean out the fridge and use a variety of vegetables. Carrots, cauliflower, green beans, asparagus, etc. would all be good in this. Just make sure you chop the vegetables to the size of peas. 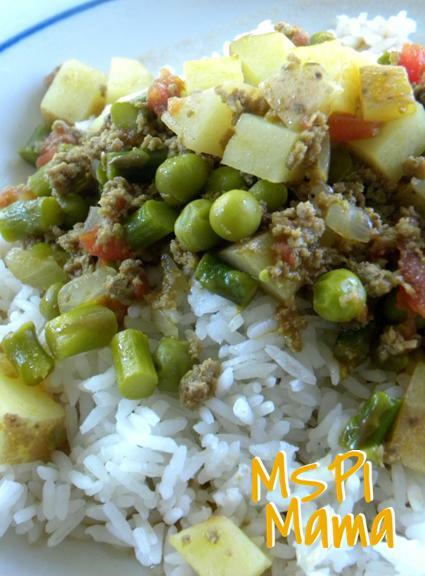 The version pictured below was made with ground turkey, asparagus and a handful of peas. We loved it! Source: Slightly adapted from Whole. New. Mom. Heat oil in a large pan. Add onion and garlic. Cook until onion softens. Add meat and cook thoroughly. Add curry, salt and spices. Stir well. Dice potatoes (keep the skin on). Add potatoes, tomatoes and vegetables to the pan -- unless you are using peas. Bring to a simmering boil. Reduce heat, cover and simmer for 25 minutes, or until potatoes are done. Add peas to pan and heat through. Crock pot recipes are all the rage right now. And why not? We're all way too busy to be slaving over the stove every evening. 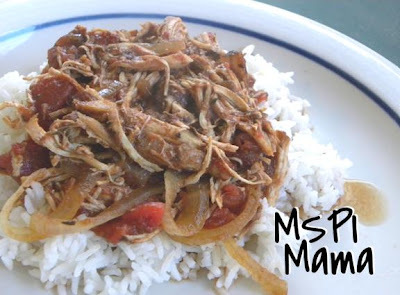 And now that fall's chilly weather upon us, crock pot meals are comfort food at its best. And an added bonus? Recipes like these are super inexpensive! Sort beans and soak in enough water to cover overnight. (Quick soak method: Sort the beans and place them in a saucepan with 2-inches of water to cover. Bring pan to a boil, boil for 3 minutes, then cover and remove from heat. Allow to sit for one hour after boiling -- don't lift the lid.) Once beans are soaked, rinse, drain and then place them in the crock pot. Add remaining ingredients to the crock and stir together. 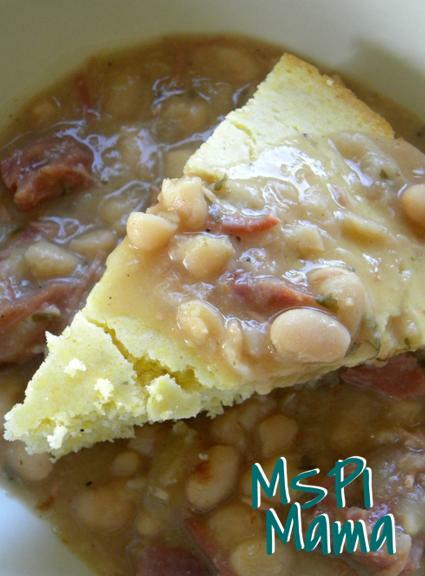 Place lid on crock, and cook on low for about 8 hours, or until beans are tender and creamy. Remove ham hocks from beans and allow to slightly cool. Remove ham from the bones and add meat back to the beans. Adjust seasonings to taste. Skim any excess fat, if necessary, before serving over corn bread. Preheat oven to 400 degrees. Grease an 8- or 9-inch round pan. Blend all dry ingredients. Stir in remaining ingredients until dry ingredients are moist. Pour batter into greased pan and bake 20 to 25 minutes or until a wooden toothpick inserted into the center comes out clean. I love it when I can make one meal for my family then turn around and revamp the leftovers for an entirely different meal a few days later. Case in point, this recipe: I threw in a few more chicken thighs and saved the leftovers for soft tacos. No muss, no fuss. Just perfect! The original recipe calls for ½ teaspoon of red pepper. I only used half that -- in order to keep my family from disowning me -- and I've listed that here. Adjust the recipe to your personal preference. Combine first six ingredients in a large bowl. Add chicken to bowl; toss to coat. 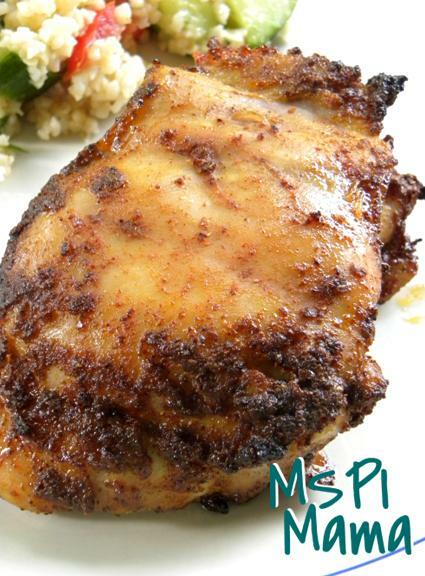 Place chicken on a broiler pan coated with cooking spray or brushed with canola oil. Broil chicken 5 minutes on each side. Combine honey and vinegar in a small bowl, stirring well. Remove chicken from oven; brush ¼ cup honey mixture on chicken. Broil 1 minute. Remove chicken from oven and turn over. Brush chicken with remaining honey mixture. Broil 1 additional minute or until chicken is done. My parents always had a big garden when I was a kid growing up in central Washington state. Even though we lived in town, our home was on a big lot, and we had the space for a huge garden. In fact, one time a small herd of cattle got loose and wandered into town. The farmer corralled them in our garden! Needless to say, my parents were not happy about all those veggies getting stomped and eaten by a bunch of cows! Despite having some pretty decent gardening genes, my green thumb is pretty pitiful. I'm doing good just keeping my pots of herbs alive. And our yard was not made for a garden. It's hilly and shady. So in order to feed my need for homegrown veggies, I joined a local CSA here in Omaha. I have loved the variety of vegetables. I've received some of the usual suspects: tomatoes, potatoes, onions, peaches, watermelon, strawberries, lettuce and cabbage. And I've also received a few unusual items: kohlrabi, garlic scapes, beets, rhubarb and a variety of greens. This recipe was made with some of those lovely greens! In a large pot or Dutch oven, heat oil over medium heat. Add the onions and cook, stirring, until onions are wilted. Add the garlic and cook for 1 minute longer. Add the chicken broth and bring to a boil. Add the mustard greens, a few handfuls at a time, adding more as the first batch wilts. Add ham and reduce heat to medium-low. Add Worcestershire sauce and a dash of hot pepper sauce. Cook, uncovered, for 20 minutes. Cover and simmer for about 30 to 40 minutes longer. Taste and add more pepper sauce, salt, and pepper. 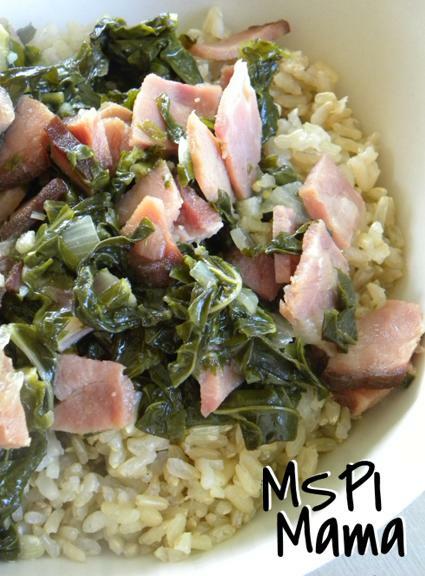 Tip: Pretty much any type of hearty greens can be used in this recipe. I often see kale and collard greens for sale at the grocery store. To say "we've been busy" around our house is an understatement. It's been crazy. School started two weeks ago. Libby is in first grade, and JD started preschool. Egads! When did my kids get so big?! At least I still have my baby girl, Caroline, to keep me company at home. So, yes, we've been busy trying to figure out the new schedule and what works best for us. Finally! Things are starting to even out, and I can get back to posting some recipes! 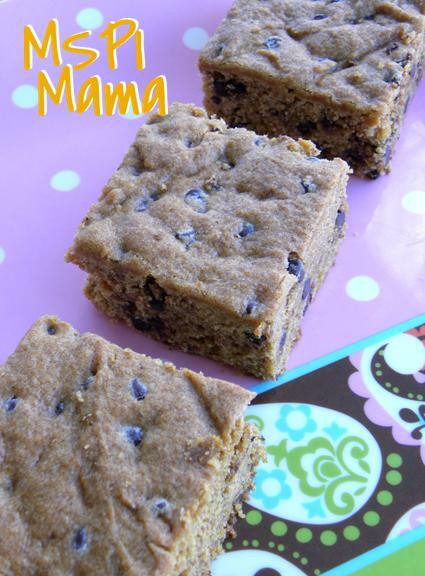 So here's a great little snack to give you and your kiddos some much-needed fuel in the middle of the day. 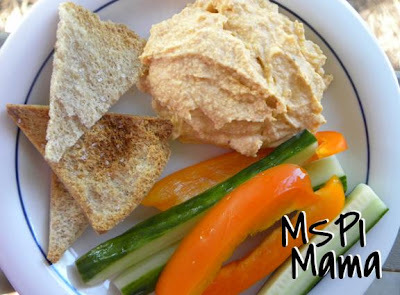 JD will literally eat hummus with a spoon, but I prefer to eat it with homemade pita chips and fresh veggies. Place all ingredients in a food processor or blender; process until smooth. Add more salt, to taste. Tip: For a smoother consistency, add a few tablespoons olive oil. I know what you're thinking: "What the heck is a clafoutis?" Well, it's a little piece of heaven. (Yeah, I know that definition doesn't help.) 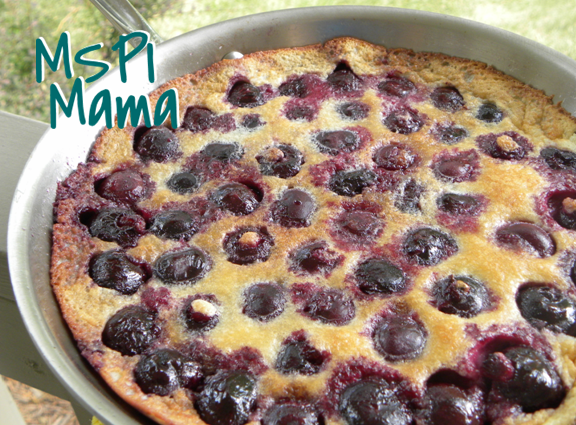 According to the culinary arts glossary at About.com, a clafoutis (pronounced kla-foo-tee) is "a rustic French baked dessert made by baking cherries in a custard-like batter similar to pancake batter." It also makes a decadent addition to breakfast or brunch. And like I said, it's a little piece of heaven. The definitive recipe for clafoutis in the U.S. is, of course, Julia Child's version, but there are many others lurking out there. And you can make it with other types of fruit, such as peaches or grapes. But the cherries are divine. I recently purchased a cherry pitter, after years of wishing I had one. (I'm still kicking myself for not buying one when I worked at Williams-Sonoma. That employee discount was lovely ... and dangerous!) Definitely worth the money if you love cherries ... and I've had a love affair with cherries since I was a small child living in Washington state. Preheat the oven to 425 degrees and place the rack in the center of the oven. Wash the cherries, remove the stems and pits. In your food processor or blender place the flour, salt, eggs, 2 tablespoons sugar, coconut milk and vanilla extract. Process for about 45 - 60 seconds, scraping down the sides of the bowl or jar as needed. Once the batter is completely smooth, let it rest while you prepare the fruit. In a large 9- inch heavy oven-proof skillet, heat the oil over medium heat making sure the oil coats the bottom and sides of the pan. (The amount of oil will depend on whether your skillet is non-stick.) When the oil is heated, add the pitted cherries, and cook until the cherries have softened a bit and are coated with the oil, 2 - 3 minutes. If using butter flavoring, add that to the pan now. Then sprinkle the cherries with the sugar and cook until the sugar has dissolved and turns into a syrup, 1 - 2 minutes. Pour the batter over the cherries and bake in the oven for about 20 minutes or until the clafoutis is puffed, set and golden brown around the edges. Do not open the oven door until the end of the baking time or it may collapse. Allow to cool slightly, then slice and serve immediately with a dusting of powdered sugar. (I forgot to do this!) Also excellent served at room temperature. Store leftovers (if there are any!) in the refrigerator. 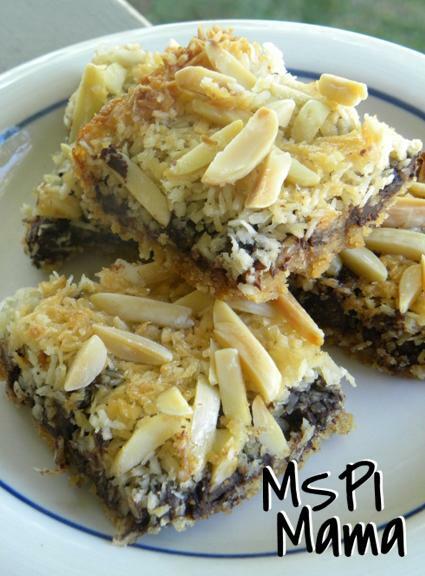 Tip: Despite the use of coconut milk in this recipe, the coconut flavor is barely detectable. So I never thought I would live to see the day when my daughter Libby would actually ask me to make a dish that contains cabbage, but that day has come and I have this recipe to thank for it. It is such a simple coleslaw recipe, but it's different enough from your regular deli slaw that it's special. And the fact it's purple doesn't hurt, either! In a large bowl, mix together mayonnaise and vinegar. Add cabbage and apples; season with coarse salt and ground pepper, and toss to coat. Refrigerate, covered, until ready to serve. 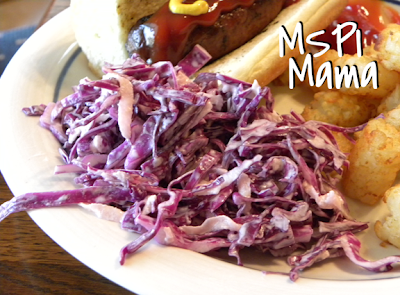 Tip: Depending on how sweet the apples are, you may want to add a pinch or two of sugar, if the slaw is too tart. So here's a very important question: Coke or Pepsi? For me, Coke wins it hands-down. I love good ol' Coca-Cola. Pepsi doesn't do it for me. And none of that diet junk. If I'm going to drink a pop (and yes, it's pop, not soda!) I'm going to drink the real thing. And it's because I won't drink the diet stuff that I've pretty much stopped drinking pop and only drink it occasionally. Too many calories that I don't need! However, I still love the stuff! Just because I no longer drink pop doesn't mean I have to completely strip it from my life, so here's a great recipe that utilizes Coke ... and I suppose you could use Pepsi, but why would you? Now, don't get freaked out about the whole pop-flavored-meat-thing. The cola flavor mellows during the cooking process. The flavor is savory and delicious, and people will be asking you, "What's in this? Whatever it is, it tastes great!" Everything cooks in the slow cooker, which makes it super easy. And if you have leftovers, the meat is great for tacos. Just reheat the shredded beef in a saucepan on the stove with a little bit of water and some taco seasonings. Delish! Spray your slow cooker with non-stick cooking spray. Add in the sliced vegetables, then the beef. Mix together the remaining ingredients (except the buns) in a bowl and pour over the meat and veggies. Cook on low for 6-8 hours or on high for 3-4 hours. When the meat is ready, remove from the pot with tongs and place on a cutting board. Strain the juices from the vegetables and set aside. Slice or shred the beef (whichever is your preference) and add some juices if needed. Layer the beef and then the vegetables on the buns, ladling some of the extra juices on top as needed or serve on the side for dipping. Tip: If your family doesn't care for spicy food, use the red pepper flakes and cayenne sparingly. The heat intensifies during the cooking process! Freezer-Friendly: Freeze leftovers in a freezer-safe package. Completely thaw the package in the refrigerator for several hours prior to reheating in a pan on the stove or in the microwave. The vegetables will turn to mush if you don't completely thaw! If you're looking for an Asian cuisine that doesn't rely as heavily on soy-based sauces, take a look at Thai-inspired recipes. Many of these delicious recipes use a combination of fish sauce -- which is quite stinky but incredibly delicious when added to recipes -- chili sauce and lime juice to flavor dishes. The result is super yummy! And if you like your food spicy, Thai is the way to go. But for those of you who want a tamer heat, just take it easy on the chili sauce. 1 lb. rice noodles -- I used Pad Thai noodles. 1-2 tsp. chili garlic sauce -- I used sriracha, which is available in the Asian section of most grocery stores. Combine first five ingredients in a food processor or blender; process until smooth. If using a food processor, add beef and pork; pulse to combine. If using a blender, combine beef, pork and contents of blender in a large bowl until well combined. Shape meat mixture into into a 1-inch balls. Heat a large nonstick skillet coated with cooking spray over medium-high heat. Add meatballs; cook 8 minutes or until meatballs are nearly done, browning on all sides. Meanwhile, prepare noodles according to package directions. Combine warm water and next 5 ingredients (water through 4 garlic cloves), stirring with a whisk until sugar dissolves. Add sauce to the cooking meatballs, allowing the meatballs to finish cooking in the sauce. 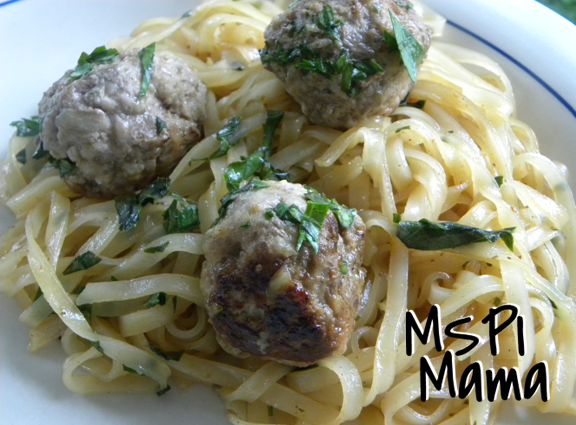 Add noodles to saucepan and carefully toss with the noodles and the meatballs. Sprinkle with fresh herbs prior to serving. Tip: I took a trip to an Asian grocery store and was amazed at the variety of rice noodles that are available, however most grocery stores will only have one or two, such as rice vermicelli or rice stick noodles. Any of those varieties will work. In fact, you could use a wheat-based pasta, as well. Angel hair or fettuccine would be good.